Brown rice, chicken and vegetables are a great combination for a heart healthy meal. Seasoning with curry makes this dish full of flavor. Feel free to add other vegetables you like, check out these vegetables that will last a long time after you buy them. Combine brown rice and 2 ½ cups water in large pot and bring to a boil. Turn heat down to low. Cover and cook until water is absorbed, about 30-40 minutes. Fluff with a fork. Set aside. You can also use a rice cooker with the same quantity of brown rice and water. In a large pan, heat olive oil and chicken broth over medium heat. Add celery, onions, and carrots. Cook for 5-7 minutes or until vegetables are tender. In a large mixing bowl, combine curry powder, garlic powder, salt, pepper, and yogurt. Add cooked vegetables, brown rice, and chicken. Mix well. Pour mixture into a baking pan and bake uncovered for 15 minutes. 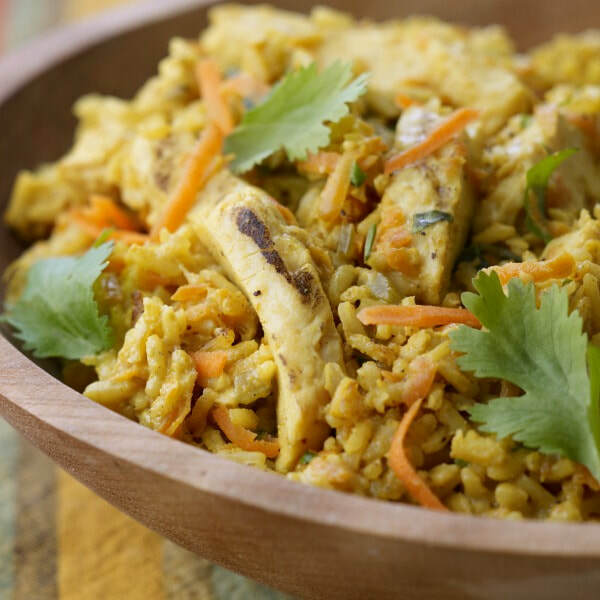 Note: To make this recipe quick and easy, try using an 8 oz package of unflavored instant brown rice.